By combining multiple immune markers measured from a single patient sample. 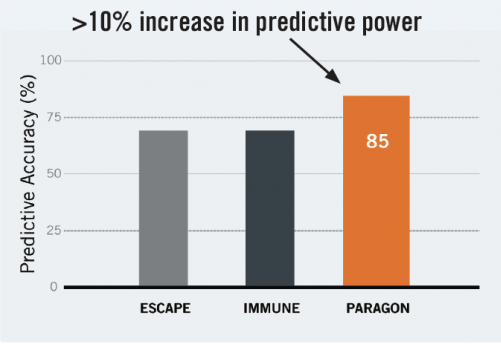 the Cofactor ImmunoPrism Biomarker delivers increased predictive power for clinical and translational studies. Cofactor's ImmunoPrism Assay provides quantitative, multidimensional immune profiling from only 2 sections of solid tumor FFPE tissue. Statistical interpretation of 8 immune cell types and 10 immune escape genes as potential predictive biomarkers for patient cohorts such as responders/non-responders, pre/post treatment, longitudinal time points, and more. Summary of positive predictive value (PPV) and negative predictive value (NPV) for each marker analyzed. Multidimensional analysis, using machine learning, to identify the most powerful predictive marker combination. 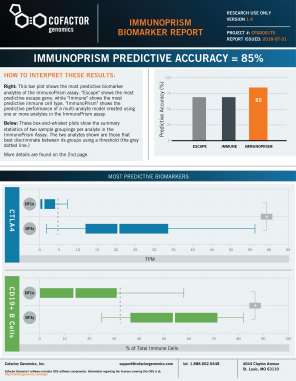 Turnkey solution for biomarker discovery for any immunotherapy or immune-oncology application. Copyright © 2013-2019 Cofactor Genomics, Inc.
Cofactor’s ImmunoPrism™ Assay is offered both for Research Use Only (not to be used as a diagnostic assay) and as a CAP-validated assay. Please contact us to discuss which option is right for your application.